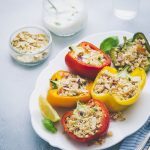 These Vibrant Vitamin enriched stuffed peppers make great party starters! Preheat Oven to 180 C | Gas Mark 4.
side down for 10 minutes and then 10 minutes turned up. Place Couscous in a heat proof bowl and add 140ml Boiling water. Stir, cover and leave it aside for at least 10 - 12 minutes. Meanwhile, chop the tomatoes, onions, basil leaves and keep it ready. Stir the couscous with a fork to fluff it up. Add the tomatoes, onions, basil, lemon juice, feta cheese and toasted almonds. Add salt and pepper to taste. Check for taste and season more if required. Spoon in the couscous mixture into the pepper halves and bake for 5 minutes. Garnish with toasted Almonds and Basil leaves. Serve with a yogurt dip and lemon wedges.